Refrigeration process system requirements: Refrigeration is a process in which the temperature of a space or its contents is reduced to below that of their surroundings. Refrigeration is used in the carriage of some liquefied gases and bulk chemicals , in air conditioning systems, to cool bulk CO2 for fire fighting systems and to preserve perishable foodstuffs during transport of foodstuff . All maintenance recommendations from the makers have to be carried out regularly and according to instructions, entered in the refrigeration maintenance log, together with the test of all cut outs, i.e. HP, LP, LO, HT, that have to be carried out at regular intervals, generally one month. All adjustment must be made according to standard good practice and records of the same entered in the log. Filter separators and driers should be regularly cleaned in order to have always the circuit moisture, dirty and oil free. When shutting down a plant all refrigerant gas must be pumped in the liquid receiver or condenser. Compressor :The function of the compressor in a refrigeration system is to raise the pressure of the vapourised refrigerant, causing its saturation temperature to rise so that it is higher than that of seawater or an air cooled condenser. The compressor also promotes circulation of the refrigerant by pumping it around the system. Condenser :The function of the condenser is to liquefy the refrigerant and sub cool it to below the saturation temperature by circulating seawater or air. Latent heat originally from the evaporator is transferred to the cooling medium. The liquid refrigerant still at pressure produced by the compressor passes on to the expansion valve. Expansion valve : The function of the expansion valve in a refrigeration system is to regulate the flow of refrigerant from the HP side of the system to the LP side of the system. The drop in pressure causes the saturation temperature of the refrigerant to fall so that it will boil at the low temperature of the evaporator. The expansion valve controls the flow of refrigerant to the evaporator thermostatically. Evaporator : The function of the evaporator in the refrigeration system is to cool the air in the fridge space. It does this because the temperature of the refrigerant entering the evaporator is lower than that of the air in the space and this causes the refrigerant to receive latent heat and evaporate. The evaporator normally has a fan to circulate the air around it. high specific enthalpy of vaporisation. (This reduces the quantity of refrigerant in circulation and lower machine speeds, sizes, etc). The effects of insufficient refrigerant in the system are a low reading on the LP pressure gauge and a lack of frost on the suction pipe. The high pressure (HP) cut out is fitted on the discharge side of the compressor in a refrigeration system. This will shut down the compressor in the event of an over pressure and can only be manually reset. Details of refrigeration cycle -How the system works ? Refrigeration of cargo spaces and storerooms employs a system of components to remove heat from the space being cooled. This heat is transferred to another body at a lower temperature. The cooling of air for air conditioning entails a similar process. The transfer of heat takes place in a simple system: firstly, in the evaporator where the lower temperature of the refrigerant cools the body of the space being cooled; and secondly, in the condenser where the refrigerant is cooled by air or water. 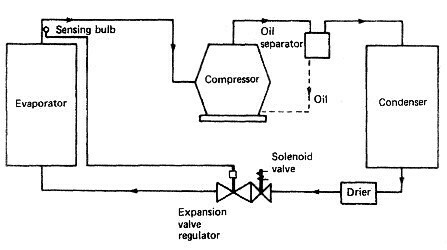 The usual system employed for marine refrigeration plants is the vapour compression cycle as shown in diagram here. The pressure of the refrigerant gas is increased in the compressor and it thereby becomes hot. This hot, high-pressure gas is passed through into a condenser. Depending on the particular application, the refrigerant gas will be cooled either by air or water, and because it is still at a high pressure it will condense. The liquid refrigerant is then distributed through a pipe network until it reaches a control valve alongside an evaporator where the cooling is required. This regulating valve meters the flow of liquid refrigerant into the evaporator, which is at a lower pressure. Air from the cooled space or air conditioning system is passed over the evaporator and boils off the liquid refrigerant, at the same time cooling the air. The design of the system and evaporator should be such that all the liquid refrigerant is boiled off and the gas slightly superheated before it returns to the compressor at a low pressure to be recompressed. Thus it will be seen that heat that is transferred from the air to the evaporator is then pumped round the system until it reaches the condenser where it is transferred or rejected to the ambient air or water. It should be noted that where an air-cooled condenser is employed in very small plants, such as provision storerooms, adequate ventilation is required to help remove the heat being rejected by the condenser. Also, in the case of water-cooled condensers, fresh water or sea water may be employed. Fresh water is usual when a central fresh-water/sea-water heat exchanger is employed for all engine room requirements. Where this is the case, because of the higher cooling-water temperature to the condenser, delivery temperatures from condensers will be higher than that on a sea water cooling system. Temperatures of domestic refrigerated rooms have to be corrected daily by the 2nd Engineer or delegated Officer, passed to the Chief Engineer and to the Master. On larger plant suitable logs will be supplied in order to enter temperature of the cargo and all other relevant details.